Freshman utility player Nicholas Polydefkis looks to make a pass in Sunday night's game against Connecticut College. The Colonials took the win, besting the Camels 20–6. 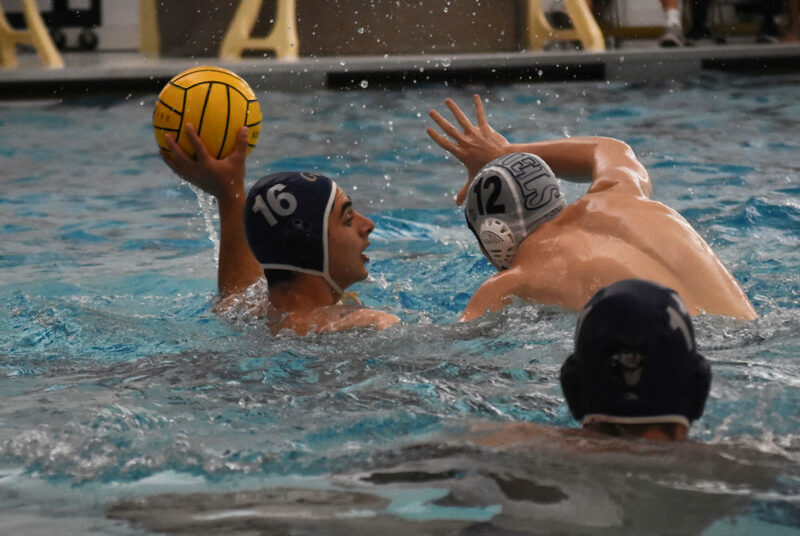 Men’s water polo garnered a decisive victory against Connecticut College Sunday night at the Smith Center. Fresh off a dominant showing against Austin College, the Colonials (15–5, 5–2 MAWPC) defeated the Camels (4–12, 2–1 MAWPC) – a Division III team – 20–6 in GW’s second win of the weekend. The victory marks the Colonials’ final nonconference match of the 2018 season and the beginning of another tough stretch of conference play. Head coach Barry King said the back-to-back victories build a good momentum heading into the rest of Mid-Atlantic Water Polo Conference play. “It’s always good when you can play off of wins rather than losses, especially as the games get tougher and more important,” King said. The game marks the sixth time this season the Colonials have held their opponents to a single-digit score while tallying 20 or more points themselves. The game opened with a goal from senior utility player Zach Slaughter, putting the Colonials in front – and giving them a lead they never surrendered. Slaughter had four goals by the time the final buzzer rang to lead both teams. He also compiled two assists, two steals, two ejections drawn and two field blocks to round out his performance. Junior utility player Atakan Destici scored three goals on the night, adding to his team-high 53 goals and earning him the 200th goal of his collegiate career. By halftime, the Colonials were up 11–3 and continued their momentum into the second half, in which they outscored the Camels 9–3. Redshirt sophomore attack player Isher Gill garnered three goals on the night, a feat heightened by the fact that he was facing off against his brother, Rahul Gill, a junior utility player for Connecticut College. King said the team had been working on refining its timing and movement in the pool after looking “stale” in recent games. The freshman players made the most of their increased pool time during this game. Seven of the Colonials’ 20 goals came from rookies, and five of the six freshman players who saw time scored at least one goal. Freshman utility player Nick Schroeder scored two goals, as well as an assist, steal and ejection drawn. A total of 10 Colonials netted goals in the win. Senior goalkeepers Matt Taylor and Austin Pyrch split time in the cage and recorded 14 saves against six goals on the night. The Colonials return to action Friday at 7 p.m. when they host Navy.